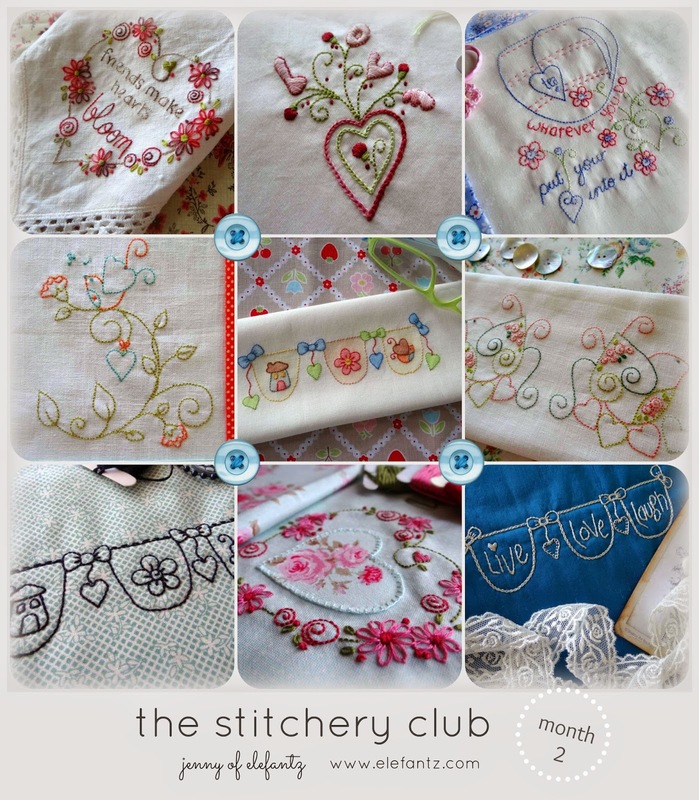 The next Stitchery Club e-mailout is almost ready for it's subscribers and it's filled with so many pretties for you to stitch! Join by November 16th to receive this set. You get all these patterns for only $6.95! Don't miss out - join up today HERE on the Club page. It's easy peasy. And I'd love to have you along for our monthly stitchy ride! 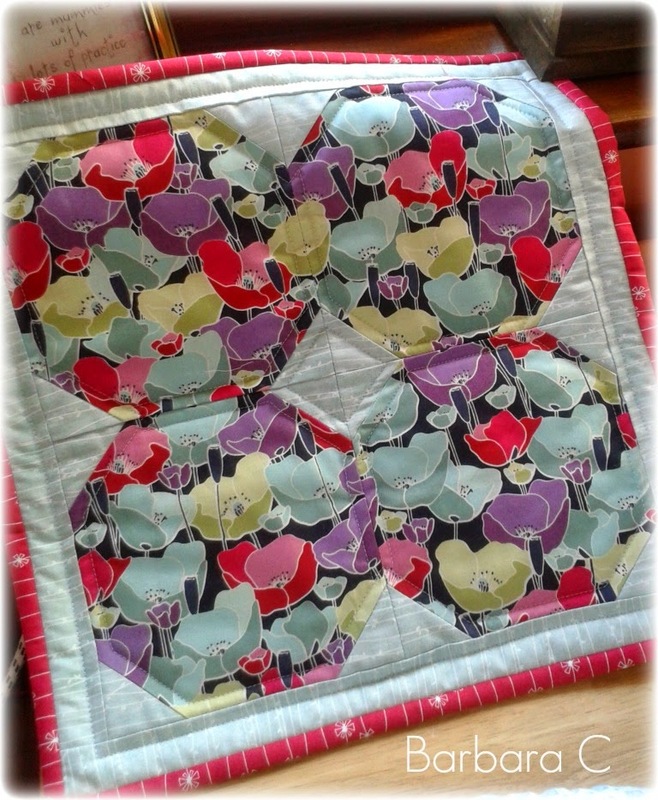 I have received a bundle of sweet photos from lovely readers who have been stitching my designs! Cass is stitching her way through all the Poinsettia designs to make a beautiful Christmas Bunting! I've also received more photos of completed Holiday Hostess projects (from my free 5-day tutorial last month). ...and also made another table topper using the snowball block tutorial that complimented the Holiday Hostess tree over the 5 days. They are both lovely! Also featuring an Elefantz Christmas design is Melody's cute as pie apron! 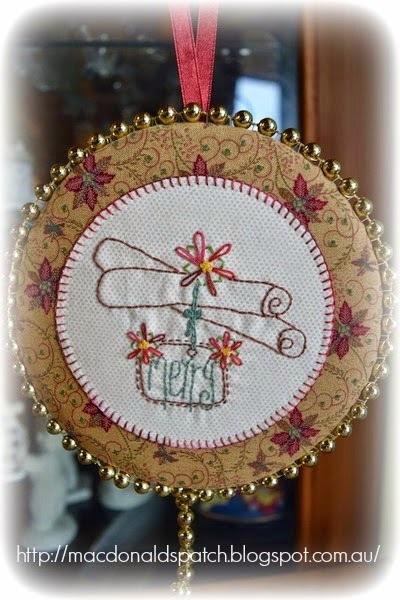 She appliqued one of my Holly Bird designs onto the bib of her apron and added the loveliest button. As soon as I saw it I knew it would be pretty high on my 'need to make' Christmas list - what about you? But not everyone is stitching Christmas projects! Margaret finished the 'Welcome Home' wall hanging, and as it's the first one I've seen completed from my pattern it's quite special to me and I got all ooey-gooey inside with pride. She made it beautifully, even taking some personal liberty by switching the direction of the saw tooth border - I love it when people add their own touch to my patterns! Kaylee followed my very popular little fabric basket tutorial and made herself a thread catcher! Very smart use of that project, I think! Well ladies, you have blown me away with your photos - your individual styles and fabrics and displays make my life as a designer a JOY. I truly love to see how you take ideas and patterns that roll out of my mind and bring them to life in a way that *you* love. 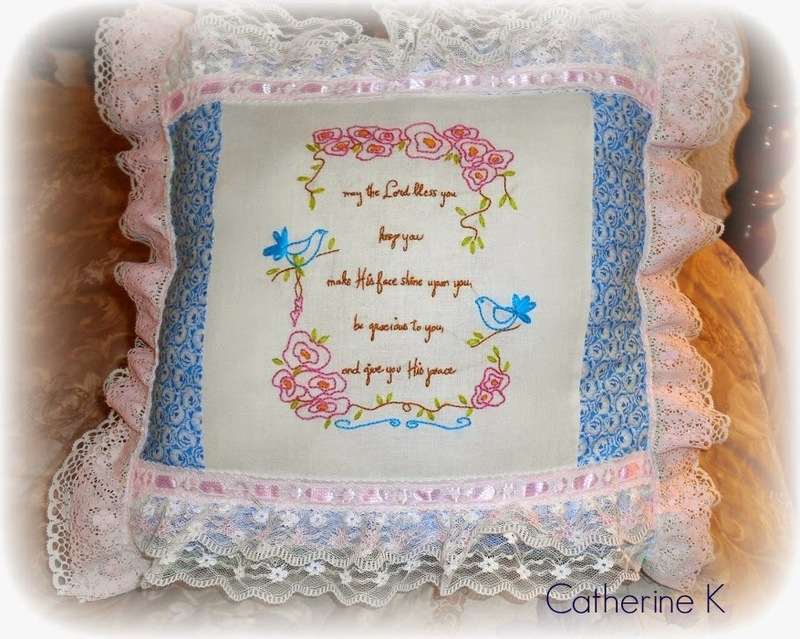 For those who would like any of these patterns, they are all HERE in my shop as pdf downloads. 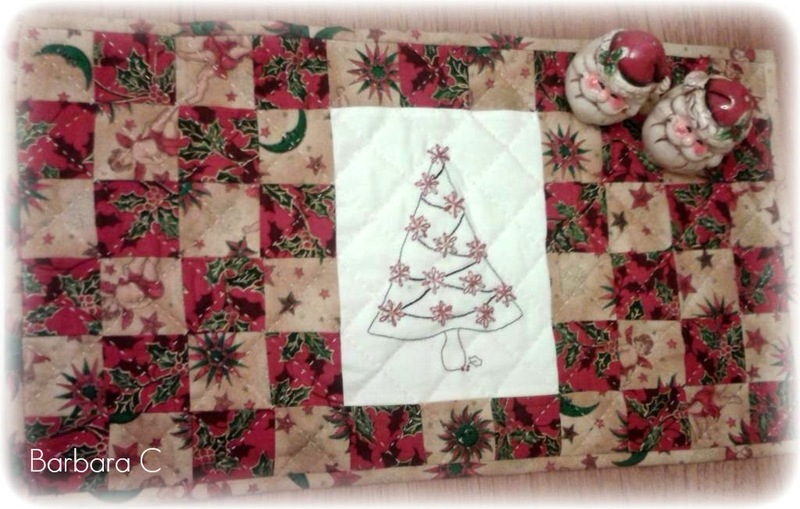 The Holiday Hostess 5-day tutorial is HERE - just scroll through the 5 days and you'll learn step by step how to embroider the tree, and to make the patchwork table topper, as well as lots and lots of hints and tips! The tutorial for the little fabric basket is HERE - it's one of my most popular tutorials of the year. All the finished projects are wonderful. Great stitching ladies. They have all made beautiful things - no wonder you feel proud! I've now got your Holly Birds on a tea towel too. I adore them. Your new stitchery designs are AMAZING - and look what everyone has made, wow! I love it all!!! Such beautiful things! It must be a wonderful feeling for you to see your work done by the hands of others. I bet you have the biggest smile each time you see one of these pictures for the first time! My favorite is that sweet lace trimmed pillow. I can hardly wait to see the new stitcheries' link show up in my mailbox! I love seeing what people do with your patterns. I'm still slowly working on the poinsettia tree. The tree and the chains and the leaf are finished. I just need a couple of free hours to make some lazy daisies! What gorgeous stitcheries by the ladies! The holly bird must be on eof my favourite designs! Thank you for including me in your lovely gallery of projects. There are some beautiful....in fact they are all beautiful projects. Well done everyone.